It is our ambition to provide our clients high performance software that secures the heartbeat of every research operation: Data Collection. We are well established and active in many countries globally, with over 90 clients in Germany, UK, USA, New Zealand, India and many more. Nebu has introduced the Nebu Data Hub, a revolutionary Big Data solution for Research. The Nebu Data Hub combines survey data with Big Data. Nebu is the only provider of an open solution for Research. Nebu recognizes that for a truly world class solution certain tools are best provided by companies who specialize in them. Nebu, therefore, adopts a best of breed approach when it comes to telephony, advanced reporting and many other complementary solutions. Investing in Nebu means investing in an established company, with a long track record and a huge ambition to conquer the world. You are investing in a company that has ticked off all requirements for our accelerated growth: Scrum process, internal organization, SaaS hosting and our Nebu Ecosystem. We have over 90 clients worldwide, with a huge potential to rapidly increase that number. Our Value Added Resellers are located in Germany, United Kingdom, Sweden, USA and Australia. We are talking to more parties in Poland, Turkey, Mexico, Pakistan and soon many more. We focus on strong relationships with our clients, from who we have received a lot of positive feedback. Many of our clients act as ambassadors to other prospects in the market. And that market is big: in Europe, USA and Australia Market Research has been strong for many decades. In Asia, Africa and Latin America it's growing strongly, as more and more companies are relying on feedback from clients and employees. Any Mode Any Place Any Time. Nebu allows you to design questionnaires, launch web, mobile, face to face and telephone field studies, in order to collect valuable market research data to deliver great insight from your market or industry. Dub InterViewer is an easy to learn, yet flexible system, that allows scripting of complex and powerful surveys. We provide personal and great support. Our team always goes the extra mile to help clients. Nebu has brought a large number of innovations to Market Research. 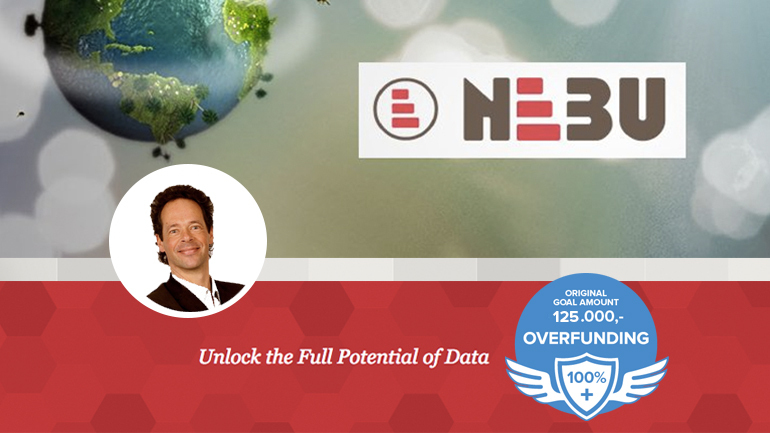 The Nebu Data Hub is a breakthrough platform that combines Survey Data with Big Data. Our clients pay an annual license fee plus a fee for the time it takes to fill in all surveys. Both are paid in advance - the license per annum or quarter and time is bought in blocks of 5,000 hours or more. For our clients this makes costs predictable and for our prospects the barrier to enter very low. When usage grows, payments to Nebu grows. We offer flexibility, as any mode can be used and clients can easily scale up and down. Nebu is an established company with a well known name in its market. With clients in many countries in Europe, in North America, Asia and New Zealand, we have a global reach. We are proud to serve clients like Blauw, Kadence, IFF, Markelytics, Colmar Brunton and many others. We cover the globe with our network of resellers and partners, the Nebu Ecosystem. We currently have Value Added Resellers in Germany, United Kingdom, Sweden, USA and Australia. We are talking to parties in Poland, Turkey, Mexico, Pakistan and will soon add many more. Our Data Collection system Dub InterViewer is used by over 90 companies worldwide, leading to millions of surveys being completed each year. The Nebu Data Hub was developed with the most modern tools and approach. Our Early Adopter program has started, the first feedback of our clients is being processed for next releases. We successfully started our network of partners with 5 Value Added Resellers and launched the Nebu Data Hub. The investment will be used to accelerate the growth of the Nebu Ecosystem and further development of the Nebu Data Hub. This year our marketing has taken a huge step forward and we will further improve this to generate more leads for our resellers. Investors will receive shares in Nebu bv, through a cooperation. The exit strategy for investors is based on growing the valuation of the company by increasing our presence in the worldwide market of data collection and Big Data software. Therefore we plan not to issue dividends but reinvest all the money we make in the growth of the company. Once every quarter we will update you with a operational and financial information. Eric studied Business Computer Sciences at the University of Amsterdam and received a Masters of Business at Nyenrode Business School. He founded Nebu in 1992 together with Fred Broers, his former business partner and started developing Dub InterViewer in 1995. Eric's passion is to create a result-driven and enjoyable work environment and to be in frequent contact with clients. Wouter joined Nebu at the beginning of 2012, initially taking on the role of Manager Customer Care. Early 2014 he formed the Technical Account Management team, with the purpose of being able to provide backup expert support for the Customer Care team, as well as dedicated attention to any specific client or situation whenever necessary. Zoltan has worked for Nebu for more than 14 years and is Managing Director in the Development Centre in Debrecen, Hungary, with responsibilities for running the office and legal administration. The main technical role is as a Chief Technology Officer: managing the Development Team and applying agile methodologies and responding to technology related requirements. Emile joined Nebu in December 2012 in the role of Product Manager. Since early 2014 he is heading the Product Management team. Before Nebu, Emile has been in a variety of Product Management roles, but always focused on data management and data collection at companies like Asset Controll and Nipo, but has also been in Product Manager at successful startup NoWiresNeeded. Berend has worked for Nebu for over ten years. Initially, in the role of supporting clients and managing the Customer Care department, and then, from 2011 in the role of CTO and from 2015 as COO. As COO Berend is focussed on letting the new functionality land in the client's processes the best way possible. Also other technical challenges like special projects has his full attention. Ian has over 16 years experience in a wide range of roles within Market Research: Starting as a buyer of MR research services for the DTi (central Government); spells with Voxco as Support and IT Manager, UK MD and head of Sales; Technical Manager for Ipsos Access panels, Department Manager for services (Stats, reporting) at Ipsos RSL; and Panel Manager at Gfk UK, before moving to Nebu. Dub InterViewer is a well established product for survey data collection in an established and growing market of Market Research. Dub InterViewer is used by over 90 organisations worldwide for online surveys, face to face surveys, call centers, closed feedback loops, customer feedback and employee feedback. Services Store is a platform through which partners can offer complementary products, like reporting, coding tools, translations, scripting and more. Dialer as a Service is one of those complementary products based on the best of breed solution Sytel and Nebu's integration. It gives clients the ability to flexibly perform VOIP-based calling. Nebu Data Hub is a Big Data solution that extends the data collection of Dub InterViewer with possibilities to add data from web traffic, sales data, social media, Internet of Things data and any other Big Data to the survey data. Our products are open, scalable, easy to operate and come with personal service (watch movie). While we focus to be the best at collection and processing of data, our solutions are open to connect any 'Best of Breed' complementary solution to it. Nebu's clients have an annual license plus a usage fee on top of that. Barriers of entry are low and revenue goes up when clients' usage goes up. License is payed up front and usage is pre-bought in batches of 'interview-hours'. This gives perfect flexibility. We have recently migrated the hosting of our SaaS offering to a partner that was specifically chosen for its scalable infrastructure as well as client focussed support. Using vmWare solutions the system can easily be scaled up for much higher usage, no matter where our clients are based. With the help of our partners (see the Nebu Ecosystem) we can easily scale for a higher number of new clients. Setting up a new client takes minimal effort and training is done in a matter of just a few days. Dub InterViewer is a mature product that is used by many Market Research institutes, all around the world. Services Store frequently receives new additions. Dialer as a Service has been launched this year and rolled out already to the first 15 users. It's based on existing components from ourselves and third party vendors and therefore a complete and ready product. Nebu Data Hub has just been alpha-released and is in an Early Adopter program with the first 5 users. Dub InterViewer is continuously updated with further extensions like new plugins, templates, Report Shop integrations and much more. Services Store only needs to be adjusted when new additions are added. Dialer as a Service doesn't need a lot of extra development, the main components are further developed by its vendors. Nebu Data Hub: Over the upcoming months we will add customers step by step. We will ask our participating customers to provide feedback, so that we can further shape and refine the product to be THE Market Research Data Hub. Nebu operates in the market of Market Research agencies, supplying professional quantitative data collection, data processing, data management and data access software. Our clients are mid-sized independent Market Research agencies worldwide and research departments of other companies. The FocusVision 2014 Annual MR Technology report of Meaning Ltd shows that 25% to 33% of MR companies are looking at changing their software provider. This gives Nebu huge opportunities, as there are movements between the different modes (CAPI, CATI, WAPI) where Nebu is able to support all modes. Furthermore there is a strong trend towards using more Big Data approaches to combining Survey data with many other sources of data, a trend where Nebu is going to be a leader in the game. The ESOMAR Global Market Research report shows that the total global Market Research spendings were roughly $40bn per annum in 2013 and growing. Earlier research of Meaning Ltd shows that roughly 2% of revenue is spent on software, with 70% of that being spent on quantitative research. With that the market is estimated at little over €500m per annum, worldwide. In the current market/product combination there are globally around 5 to 10 software vendors focussing on a comparable combination. With the new Nebu Data Hub we focus on an upcoming market and so far we know of only one competitor seeing the same opportunities. This gives us a huge advantage over the ones who are not yet seeing the opportunities of Big Data for Research. Nebu currently serves over 90 clients globally. Our largest client accounts for 5.2% of our revenue and our top 20% (18) clients represents 45% of revenue. Many of these clients are well known names in the market and positive showcases towards prospective clients. Existing clients are very loyal, representing this year 91% of recurring revenue. We are proud to have received a lot of positive feedback, a summary can be found here on our website. Some more comments can be found here on Capterra. First feedback to the Nebu Data Hub from our Early Adopters and others is very positive and confirms our vision about where the industry is going. Nebu's focus is to attract more resellers and other partners (like system integrators) globally and build the support organization to let them excel. This makes the growth potential exponential. We call this the Nebu Ecosystem. In 2015 the number of Resellers will grow to at least 8 and in 2016 the goal is 25. In terms of new clients we expect in 2015 a total of 8 new clients with an average revenue of €35k, in 2016 our aim is 20 new clients with an average annual value of €50k. In 2017 we'll grow further with 40 new clients. In 2014 we have migrated our mailing database and website to HubSpot, a leading solution for inbound marketing. This has enabled us to easily publish blogs, send out newsletters, distribute white papers, update our website, all while seamlessly building a database of contacts. In 2015 we have invested €75k YTD on improving our marketing. This has resulted in a number of professional videos to show and promote what we have to offer, see for example our channel on YouTube, as well as multiple blogs, white papers, every two weeks a Newsletter, communication on LinkedIn, Facebook and Twitter, ads on LinkedIn and Adwords, presence on conferences, new brochures and more. We have extended our reseller network, which existed already in a few European countries, to the USA, Canada and Australia. We continue our online activities using HubSpot as well as an increase of the number of conferences and trade-shows where we exhibit and/or which we visit to network. The goal of our marketing is to increase the top-of-mind awareness when companies want to switch software to a new platform. Partnerships is the core of Nebu's sales strategy and our vision, see www.nebu.com/the-nebu-ecosystem. Using our partnerships we are able to focus on that what we are best at: software development and personal service. Our partners add complementary tools and services, like scripting, reporting, and more. Nebu has grown into a €2m plus company. Before the crisis we had a decent annual growth, completely on our own funds and capacity. In 2012 we reached our highest revenue of €3.6m and sold a part of the company at the end of that year to a global panel company, after we decided to fully focus again on data collection and data management. The years after that were years of consolidation, allowing us to improve processes and build up the Nebu Ecosystem. Focus on adding new resellers will lead to at least 15 by end of 2016. Number of new clients per reseller per year will average on 5. Number of clients will grow from 90 now to 400 by 2020. In the last two years we have started to build the Nebu Data Hub by reinvesting all money we earned back into the company. There are no external investors in the company yet, it's 100% privately owned. This crowdfunding campaign is part, and the first step, of potentially 3 steps. We are aiming here for €125,000 to €200,000 for 5% to 8% of the shares. Another investment will come in in Q1 2016. Depending on growth in the next 12 to 18 months, and possibly a much higher potential in the market, we will then look for a €1,000,000 to €2,000,000 investment to aim for a growth to €20m or higher. We have prepared the organisation for welcoming more clients. Hosting, servicing and building the partner relations for additional services are all in place. We started a professional level of marketing. Further expansion of the Reseller program. With area managers we will increase the number of resellers in the different regions of the world. Marketing. Our marketing will be focussed on increasing brand awareness, to attract more resellers, more partners and to fill the funnels of our resellers with more prospects. Development team. Using the Scrum development methodology we respond quickly to market demands. An increased size of the development team will accelerate the development and continuous deployment further. Support. New clients will require more people in the support teams, to keep transforming our clients into ambassadors. We have the ambition to grow to over €10 million revenue in the next five years. Value of the company should be in the range of €12.5m to €15m by 2020, leading to 400% - 500% return on investment. We limit our risks by working with a reseller model: new sales comes from 100% commission based Value Added Resellers. Not growing fast enough - We have a timing advantage right now. We have to make certain we keep our ambition high to stay ahead of the competition.